George Holcombe was born circa 1833 at OH.1 He was the son of Laomi Holcombe Jr. and Patience Pelton.1 George Holcombe married Matilda Deming on 11 March 1858 at Bronson, Huron Co., OH.2 George Holcombe died on 26 October 1864 at Confederate POW Camp, Preston, Grayson Co., TX. George and Matilda were enumerated in the 1860 Farmington, Jefferson Co., WI, federal census. He was a farmer, age 25; she was 21. The only child in the household was Esther1. George enlisted as a private in Co. B., 29th Regt. WI Vol. Inf. 21 Aug 1862; mustered 27 Sept 1862, -- Capt. Thomas Moots; fought at Sabine Cross Roads, LA; was captured 8 Apr 1864 and died of chronic diarrhea while a prisoner. by Billy R. M. Fifer, Co. C, 77 Illinois Vol. By the thirteenth army corps. And boldly led the way. And charge upon the foe. They felt their cause was right. Ne'er seen that evening close. Close by a running brook. Upon the field did lay. And anxious for a fight. We might expect a fight. Was a narrow strip of pines. A hot time we would see. When rebel lead they'd feel. And rushed into the fight. By those in high command. He boldly led the way. To them it was severe. While round them lay their dead. They did not like to quit. They laid the rebels low. Did seem disposed to shirk. Like letters wrote with gold. He sealed it with his blood. They were compelled to fly. And met a cruel fate. Show better blood for fight. He did not like to yield. His more than spartan band. No General could do more. They too did have to run. And held the rebs in check. They saved the 13th corps. Was ready for a fight. He saved what we had lost. Both corpes would have been lost. The eighth to us was gain. [S25] Hannah McPherson, Holcombe Genealogy, Page 213.2. [S25] Hannah McPherson, Holcombe Genealogy, Page 214.1. John Holcombe was born circa 1835 at OH.1 He was the son of Laomi Holcombe Jr. and Patience Pelton.1 John Holcombe married Caroline Baker, daughter of Thomas Baker and Mary Ann (?). Rosina Holcombe was born circa 1839 at OH.1 She was the daughter of Laomi Holcombe Jr. and Patience Pelton.1 Rosina Holcombe married Aaron Baker, son of Thomas Baker and Mary Ann (? ), on 4 June 1859 at Jefferson Co., WI. Aaron and Rosina were enumerated in the 1880 La Grange, Lorain Co., OH, federal census. He was a Farm Laborer, age 41, she was 38. Children in the household were Euletta 12, and George 4. Fanny Hastings was born circa 1814 at NY.1 She married Asahel Holcombe, son of Noah Holcombe II and Eunice (? ).1 Fanny Hastings died on 1 March 1855. She was buried at Knowles Cemetery, LaGrange, Lorain Co., OH. Matilda Hastings was born circa 1824 at Wilna, NY.1 She married Nahum Holcombe, son of Noah Holcombe II and Eunice (? ), on 30 March 1842.1 Matilda Hastings died on 17 July 1884. Perhaps the George enumerated in the 1900 Grafton Twp. Lorain Co., OH, federal census, born Dec 1847, wife Alma, son Penn, and brother in law Harrrison H. Holt. Percival and Mary were enumerated in the 1870, Lagrange, Lorain Co., OH, federal census. He was a carpenter age 27, she was 25. Children in the household were Amanda 5, emma 3, Paul 2, and Elizabeth 8 months. It was probably this "P. Holcomb" that was elected the first marshall of La Grange Village when it was incorporated in 1875. A "D. Holcomb" was elected councilman. Percival and Mary were enumerated in the 1880 LaGrange, Lorain Co., OH, federal census. He was a carpenter, age 37, she was 35. children in the household were Amanda 15, Emma 13, Paul 12, Elizabeth 10, William 8, John 6, and Darius 4. Purciva and Mary were enumerated in the 1900 Lagrange, Lorain Co., OH, federal census. He was 57, she was 55. They had 12 children, 11 whom were still living. Children in the houehold were Lizzie 30, John 26, Darius 24, James 21, Robert 20, Francis 15, and Edith 13. Mary F. was enumerated in the 1910 Lagrange, Lorain Co., OH, federal census. She was 64. Children in the household were elizabeth A. 40, Edith 23, John P 36, Robert 30, and Frederic 28. Mary F. was enumerated in the 1920 Lagrange, Lorain Co., OH, federal census. She was 74. Children in the household were Lizzie A. 50, Fred 36, Frances 34, and Edith M. 33. Ellen Holcombe was born circa 1841. She was the daughter of Noah Holcombe III and Emily Crane. Ellen Holcombe died in 1851. She was buried at Knowles Cemetery, LaGrange, Lorain Co., OH. Charles and Jane were enumerated in the 1870 LaGrange, Lorain Co., OH, federal census. He was a farm laborer, age 24, she was 24. [S504] Anita A. Reid, "Wardsey Searle Holcombe," e-mail to James H. Holcombe, 5 March 2004. Lewis and Amanda were enumerated in the 1880 Leola, Adams Co., WI, federal census. He was a farmer, age 23, she was 23. Children in the household were Roy, 4 months, and Emma Holmes, step-daughter, age 7. Lewis and Amanda were enumerated in the 1900 Colburn, Adams Co., WI, federal census. He was a farmer age 43, she was 43. Children in the household were Roy 20, Afred 18, Harry 15, Ruby 12, Robert 9, Carrie 6, Ray 4, Lyman 2, and Leone 1. Lewis nearest neighbors were brothers Clark and Otis. Lewis and Mandy were enumerated in the 1910 Colburn, Adams Co., WI federal census. He was a farmer age 54, she was 54. Children in the household were Robert 19, Cary 16, Ray 14, Lyman 11, Leone 10, and Donald 5. Lewis and Mary A. were enumerated in the 1920 Colburn, Adams Co., WI, federal census. He was a farmer age 63, she was 63. The only child in the household was Donald, 15. [S737] Tim Dressler, "Lewis Augustus Holcombe," e-mail to James H. Holcombe, 12 August 2011. Abigail Jane Wanzer was also known as Abby J. She was born in 1836 at NY.1 She married Austin Holcombe, son of Laomi Holcombe Jr. and Patience Pelton, on 24 March 1859.1 Abigail Jane Wanzer died in 1926. She was buried at Lake View Cemetery, Jefferson Co., WI. William George Holcombe was also known as William Julian Holcombe. He was born on 8 March 1870 at WI.1 He was the son of Austin Holcombe and Abigail Jane Wanzer.1 William George Holcombe married Clara Alice Sears on 1 August 1895 at Jefferson Co., WI. 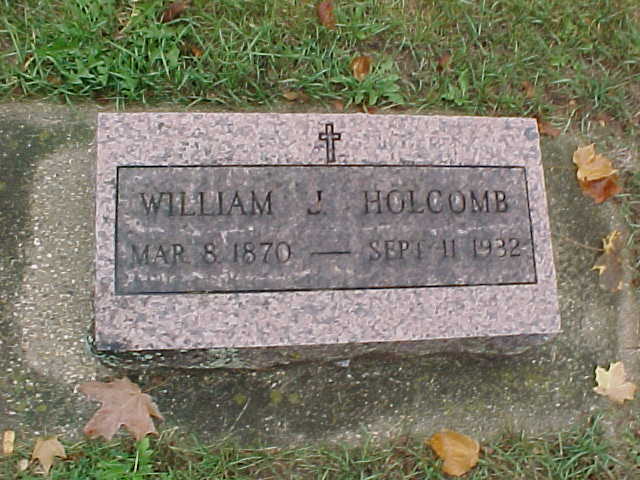 William George Holcombe died on 11 September 1932 at age 62. He was buried at Lake View Cemetery, Jefferson Co., WI. There are two Laomi Holcombe men in this family that can be confused. Laomi son of Laomi, and Laomi son of Noah. They are first cousins, and their common ancestor is Noah (b. 1752). Laomi Jr. was enumerated in the 1830 Carlisle (LaGrange), Lorain Co., OH, federal census. His household consisted of males: under 5 3, 20-30 1; females 20-30 1. The dates for Patience's birth and marriage were from undocumented web forums. On 20 September 1850 Laomi and "Patia" were enumerated in the Concord, Jefferson Co., WI, federal census. He was a farmer age 45 born in VT, she was 40. Children in the household were Wardsey 22, Austin 21, George 15, John 14, Patience 13, Rozina 11, and Lucy 5. On October 3rd 1850 Laomi and Patience were enumerated in the LaGrange Twp. Lorain Co., OH, federal census. He was a farmer age 50 born in NY, she was 48. Children in the household were Austin 20, Lucretia 18, George 16, John 14, Patience 12, Rosina 10, and Lucy 4. 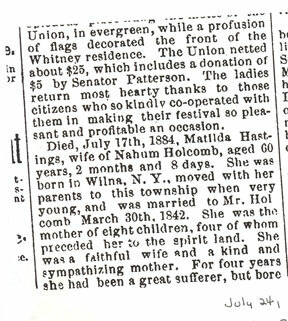 Laomi and Patience "Halcomb" were enumerated in the 1860 Concord, Jefferson Co., WI, federal census. He was a farmer age 60 born in VT, she was 46. The only child in the household was Lucy 16. Son Wardsey was his nearest neighbor. Laomi appears back in Lagrange, Lorain Co., OH in the 1870 census, age 69. Also in the household are a 29 year old female "Clara"? born in Ohio, Eliza a 2 year old born in MI, and Alvira an 11 month old born in OH. [S496] 1 June 1830 Federal Census, unknown repository address. [S494] Barry Boyer, "Barry Boyer," e-mail to James H. Holcombe, 6 January 2004. Charles and Malvina were enumerated in the 1900 Leola, Adams Co., WI federal census. He was a farmer age 46, she was 40. The only child in the household was Ora 19. Sister-in-law Eleanor Holcombe, age 34 was also enumerated in the household. Clark and Artemissa were enumerated in the 1900 Colburn, Adams Co., WI, federal census. He was a farmer age 38, she was 38. They had been married 19 years and had two children, both still living. The only child enumerated in the household was Emily A. 12. It appears to be Clara enumerated in the 1900 Leola, Adams Co., WI, federal census with husband Charles (--?--). They named a son born in Sept 1890 "Wardsey".